Dr YSRHU Polytechnic Horticultural Diploma Courses Counselling Dates, Certificates verification: Dr. Y.S.R. Dr. Horticultural University will issue the Diploma in Horticulture Admissions 2018 Notification on 19th May, 2018. The Y.S.R. Horticultural University would invite applications from the eligible candidates for admission into Two years Polytechnic Diploma in Horticulture courses in its colleges for the academic year 2018-19. Now, Dr YSR HU has prepared the eligible candidates list based on grade point average and list has been placed on its web portal. 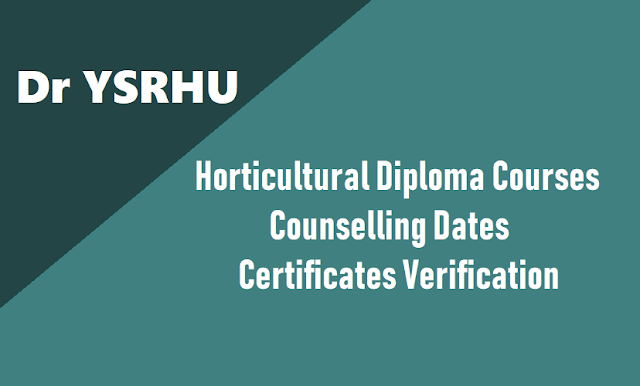 The Horticultural University has announced the Horticulture diploma course admissions counselling dates and counselling - certificates verification would be started from August 01 to August 02 and more details @ http://drysrhu.edu.in/.